Buried treasure in New York can be found. Although this article will start you on your search for treasures in New York, it’s only the beginning. The stories below have been around for many years, and like many stories, each time a lost treasure story is told, it changes. People who tell the story have a way of manipulating a certain word or paragraphs. Sometimes, just a few small changes in how the story is told, can throw the treasure story way off course from it’s original legend. This is why it’s critical to research all of the treasure stories you come upon. The more information you have regarding any hidden treasure, the better your chances of locating one. You should start your research on the Internet. However, do not rely solely on that information. If you need or want more information, then try to visit the historical societies of the area you want to search in. If you cannot visit them personally, you may be able to search their files on the Internet. Most historical societies have a website. Get into the habit of asking questions at the historical societies. You will be surprised at what kind of information you can gather. Also, read old newspaper articles, and old books. Search out any clues, or more leads that could help you in your search for buried treasure. If you do not own a detector, you should think seriously about purchasing one. 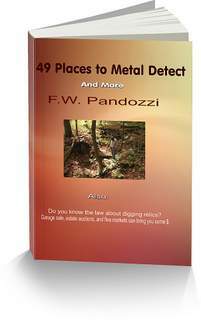 Detectors make searching for hidden treasure much easier. However, do not spend more that $450. You don’t need a detector with all of the bells and whistles. The expensive models can be confusing for new users. If you read and understand the owners manual, and you understand how it works, by using it often, you will be rewarded with finding many nice objects, or perhaps even a buried treasure. Buried treasure in New York are out there. Here are seven areas to begin your search for buried treasure in New York. Gardiner‘s Island - located on the eastern edge of Long Island, was used as a stopping point for the British during the Revolutionary War. Many of these areas hold many relics. Butlersbury Mansion is located near Fonda, on Switzer Hill. This home was built in 1742 and occupied by two, hated Tories, John and William Butler. Both men raided Patriots during the Revolutionary War, and then escaped to Canada. Supposedly, a vast treasure, or treasures are buried in or around the mansion. German Flatts is located along the Mohawk River. It is a ten mile strip of ruins from the Palatine settlement that existed in the early 1700's. The homes were plundered and destroyed, and many of their occupants were killed by both the Iroquois Indians, and the Tories, during the Revolutionary War. Many occupants buried their possessions before the raids. And of course most died, leaving their caches behind. Sharon Springs, located on route 20, was a popular place for both the Patriots during the Revolution, and the British. Skirmishes between the two took place around Sharon Springs. Treasure hunters have located artifacts in the farm fields of that area. The Sulphur Springs Treasure, is a story about a traveling medicine man in the early 1900’s who supposedly buried two chests of treasures, near the ruins of the Sulphur Springs Health Resort, located between North Pitcher, and Pitcher, on county route 26. Silver Creek is located approximately eight miles northeast of Dunkirk on Lake Erie. Silver coins are found along the beach. Most likely from the steamship wreck, Atlantic, that went down in 1852. It was carrying approximately $60,000 in coins. Grand Island is located between Buffalo and Niagra Falls, in the Niagra River. A well to do, French merchant named Clairieux buried kegs of eighteenth century coins near his home and store. Are You Interested In A Metal Detector Or Accessories? Visit my store and see what great deals there are on metal detectors, accessories, and much more. My research page is here. Good luck! And have fun in your search for buried treasure in New York. Anytime you are going on to private property be sure to ask for permission. If you are going on to State or Federal lands to search for buried treasure in New York, you should know the laws of that State. Buried treasure in New York may be located in ghost towns.